Though we always love to hear from you, we thought we could save you time by compiling the top 5 questions we receive at Support and our quick answers so you can get back outside to enjoy your summer in the sunshine. Meet our English Support Team! From left to right: Anne-Line, Tom, Aysha, Mohammad and Ryan. 1. Why isn’t my website on Google? You’ve created a beautiful website, and now you’re ready to see it in all its glory—listed on Google of course. Before you have a Mel Gibson worthy meltdown, take a deep breath and relax because it can take a few weeks for a new website to be indexed on Google. Most people assume that once you build a website, Google will automatically add the site to its index. However, Googlebots need time to crawl through millions of websites a day and create an index for your website. If your site is indexed, you know that Google has found it. But that DOESN’T mean you’re going to be on the first page of search results. To improve your search engine ranking, follow these simple steps. We’ve all been there. Ready to throw the computer out the window because it just isn’t working, and then someone from IT comes along and plugs in the computer cord…. Before you jump to step 2, make sure that Google hasn’t already added your site to its index. To do this, log in to your website and go to Settings > SEO > Google Indexing. This will show you a list of all pages on your website that are in Google’s index. If you see at least one result displayed, your site has been indexed. Need some professional help improving your website’s SEO? Get expert advice from a SEO Coach. If you check and your website still hasn’t been indexed, you can try to speed up the process. Google will index your site more quickly if you submit your website address via Google Search Console, or you can increase your chances even more by claiming ownership of your site with Google Webmaster Tools. Now that Google is aware of your website, it’s more likely to index it sooner. Learn how to optimize your site and rank higher with certain keyword phrases and competitor research. Be sure to check out our Support Center’s extensive step by step SEO guide. 2. How can I improve my online store? The legendary Harry Selfridge didn’t wait for customers, he actively drew them into his store with lavish window displays, an easy-to-navigate store layout, and prolific, buzz-worthy product advertisements. Shopping experiences may have changed in last 100 years, but one thing remains the same: the customer is key. Follow these 4 easy tips to create the best online store for your customers. Create individual product pages: It’s tempting to put all of your products on one page, but it’s important to give each Store Item its own product page. Individual product pages help boost your SEO, give a unique URL to each item in your store, and provide you with more space to describe your product in detail. Choose fabulous product photos: Since customers can’t physically hold or see your product, you need to provide them with the next best thing—excellent photos of your products. Have a camera? Learn how to take professional photos with a DIY light box. Get creative with how you display your product photos on your website. Why not add additional product photos and photo galleries to each product page? Fill out all of your SEO settings: Take the time to fill out the SEO settings for your website and product pages. Think about what keywords people type into Google when searching for products like yours. Learn more about keyword research and check out our 5 easy SEO tips for your online store. Add an FAQ section: You might think that customer service is completely reactive, but some customers need support before they make a purchase. Creating a helpful frequently-asked-questions section on your website preemptively answers common questions they might have. This means they don’t have to wait for a response from you and can purchase your item. 3. What is the best template for my website? Whether you’re creating your first Jimdo site, or want to give your current site a makeover, the template you select directly impacts the overall look and feel of your website. It’s easy to be distracted by the sheer number of templates available and focus entirely only on sample content—especially as you can use any of our templates! However, don’t choose a template because it has the most similar content to yours because our templates aren’t content specific—there isn’t a ‘photography’ or ‘cooking’ template. Since our templates are entirely based on structure, we recommend that you learn the different parts of a Jimdo template and decide what pieces are most important to you. 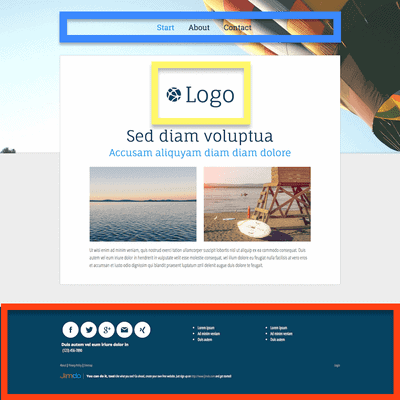 There are five essential parts to a Jimdo template: Header and logo area (yellow), Navigation (blue), Content Area, Sidebar and/or Footer (red). Every template has these five key parts, however, each template will arrange these parts in different ways. Once you are comfortable with how the different parts work, you will know exactly what parts you want on your website and choose a template on that criteria. Sometimes we just want a quick list of recommended templates for your website, so we’ve matched our most popular types of websites with recommended templates below. Blogs: If you want a sidebar on the left or right, try Reykjavik, Milano, or St. Petersburg. If you want a wide content area, try Singapore, Berlin, or Zurich. Portfolios: Rio de Janeiro, Cairo, Zurich. If you want a slide-in menu, try Copenhagen, Sydney, or Cape Town. Still not sure which template is right for your website? Let our Template Filter help you find the perfect one, or learn how to pick the perfect template for your website. Looking for some extra design help? Connect with a professional designer to help you choose and design the best template for your website. Remember that no decision is final. You can change your template at any time and not lose any of your content. 4. How do I set up a blog on my Jimdo site? Setting up your Jimdo blog is easy. Simply follow these steps and you’ll be blogging like a pro in no time. After logging into your site, click on the Blog icon in your menu. If you’ve never used the blog before, select the Activate Now button. Once you’ve activated your blog, you’ll be prompted to write your first blog post. If you weren’t brought directly to a new post page, simply click “Write a new post” and you can start writing a blog post from scratch. Now comes the fun part, building your first blog post! First, you need to fill out the blog post settings. Then, build your blog post the same way you build pages for your website—by adding Text, Photo, and any other Elements to the page. If you need help designing your blog post, Suggested Layouts can help you quickly structure your post and provide design inspiration. All posts are private until you’ve made the post public. Go ahead and practice writing a blog post, you can easily edit or delete the post later. Updated: We’ve updated our blogging tool to add a ton of new features! For the latest information on setting up a blog with Jimdo, check out the Blog section of our Support Center. 5. I already own my domain. Can I use it on my Jimdo site? If you’ve already found the perfect domain for your website, you can easily use that domain on your JimdoPro or JimdoBusiness site. Do you manage several domains for multiple websites, including non-Jimdo websites, and want to keep them all in one place? Or, do you want to maintain full control over your domain? Then we recommend you keep your domain with your current hosting company and simply connect it to your Jimdo site. This process takes about 48 hours. You can easily connect your domain to your Jimdo site by following these two simple steps. Do you want to have your domain and website in one place? Then we recommend transferring your domain to Jimdo, and we can host it for you. This process is slightly more complicated, but the added benefit is that you won’t have to pay a domain renewal fee since your domain will be included in your annual JimdoPro and JimdoBusiness subscription. To start the transfer process, first, check your domain meets the following requirements. If not, then we suggest connecting your domain instead (Option 1, above). If your domain meets all the requirements, follow these steps to transfer your domain to Jimdo. Note: Please keep in mind that the entire transfer process may take more than three business days. Have questions about building your Jimdo site? Let us know in the comments or get in touch with our wonderful Support Team who are always happy to answer any of your questions.